12.5" RCOS @ ~f/9 (2880 mm fl) 0.64 arcsec / pixel. The Zoomify image scale is 1.28 to 3.33 arcsec / pixel. For color balancing, a few NOMAD1 stars were selected by hand to determine the white reference with eXcalibrator's manual calibration method. CCDStack to calibrate, register, normalize, data reject, combine the sub exposures and create the RGB color image. PhotoShop for the LRGB combine and final tweaks. North is ~ to the top. The image is rotated 35° clockwise. This group of nebulae is located in the constellation Auriga. 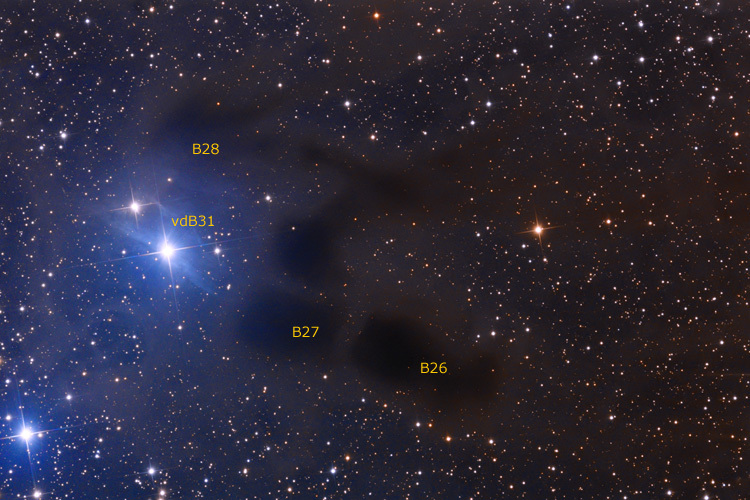 The bright blue reflection nebula is vdB31. In 1966 Sidney van den Bergh published a catalog of 158 reflection nebulae. As the name implies, reflection nebulae are clouds of dust that reflect the light of a nearby star or stars. They appear blue because the nebula more efficiently scatters blue light. This is the same reason why our sky appears blue. 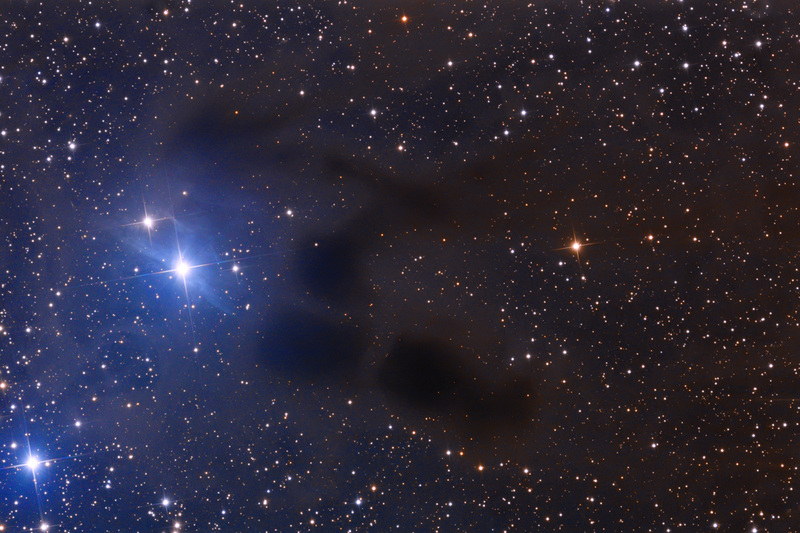 The other objects of interest are three dark nebulae, cataloged by Edward Barnard as B26, B27 and B28. Starting in about 1919 Barnard photographed and cataloged 370 dark nebulae. A dark nebula is a dense interstellar cloud that obscures the light of objects behind it. The clouds are composed of very small dust particles, coated with frozen carbon monoxide and nitrogen. These dark clouds are spawning regions for stars and planets.